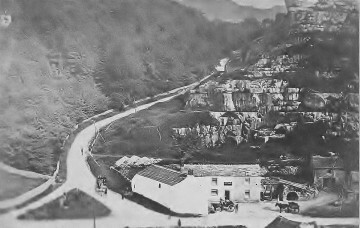 The picture shows the Ball Inn, a public house which was situated on The Dale at its junction with the turning for Eyam. It was demolished in 1921. There is little evidence of the Inn today, besides an empty space and one outbuilding which can be seen at the top right of the picture. 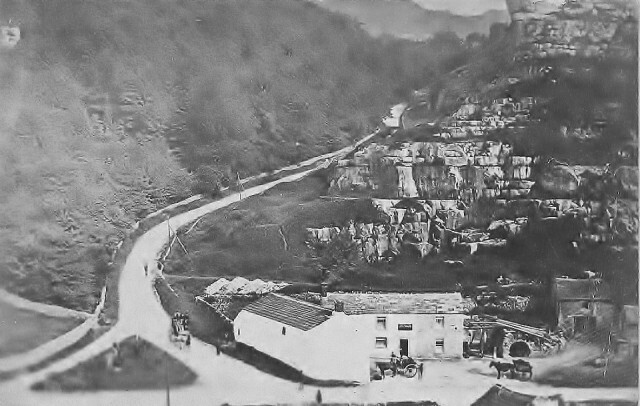 The Inn is likely to have been busy in its day, with the activity from the quarries which were across the road and to either side. The picture shows a horse waiting patiently in the car park (or should that be horse park), or perhaps enjoying a rest from pulling the loaded cart to which it is attached. There is also another horse pulling a trap which appears to be a couple of people stopping for a drink or to rest their horse. Coming down the hill from Eyam is a stage coach pulled by two horses, this is likely to be have detoured to Eyam to pick up or drop of people or mail from its main route along The Dale between Chesterfield and Manchester. The Ball Inn was a coaching Inn and the stabling facilities can be seen to the right of the picture.